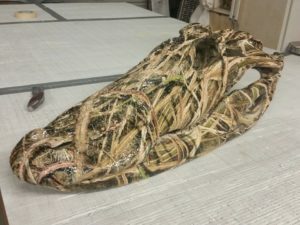 Hydrographics, (also known as water transfer printing or hydro dipping) is a method of applying printed designs to three-dimensional surfaces. The dipping process can be used on metal, plastic, glass, hard woods and more. Whatever you desire to customize, we can do it. Interior and exterior auto parts and trim, firearms (dis-assembled), motorcycles and various outdoor equipment. We also custom paint many smaller items ( airboat rudders, helmets, small car parts, etc.) using a variety of colors and candy finishes. We have a wide variety of patterns available to us and limitless ideas for your custom project. Whether your preference is Camo Print, Wood Grain, Carbon Fiber or something more funky, we’re the team you want. We specialize in the process of Hydro-dipping and painting , therefore helping you achieve that one of a kind look.